Recipes How to Make a Delicious Chicken Koloke Practical -Koloke Chicken is one of the recipes that come from china, but quite often found in Indonesia. It tastes good and healthy typical Chinese dishes, making it much preferred by many. 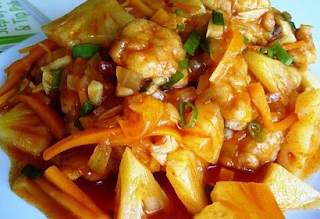 The general form of this is in the form of chicken koloke diced chicken with flour then fried, then doused with a special sauce flavored sweet and sour. If you are by chance this koloke chicken enthusiasts and want to really know Recipes How to Make Chicken Koloke it, you can follow the recipe below makes a step at a time. The first step. Marinate chunks of chicken fillets with salt, pepper and garlic, then let stand briefly. The second step, coating Mix all ingredients, then stir well and set aside. The third step, Dip the chicken fillets into beaten egg, then roll into the coating material to the entire surface of the fillet chicken covered in flour. Furthermore, heat the oil, then fry chicken fillets over medium heat (to be cooked evenly and not get burnt) until soft and lightly browned look. Then, remove and drain. Next, Making Sauces and Presentation: Saute onion and garlic until looks wilted and taste fragrant, then enter the ketchup and sauce English, and mix well, then add water and add sugar, salt and carrots, then cook until soft. Then enter the pineapple and cook until visible bubbling, do not forget to test it seems to fit according to your taste, if it is considered fitting tastes, Thicken with a solution of cornstarch and cook briefly, then lift and immediately pour over the chicken fillets that have previously been laid on a serving plate, then made your koloke chicken ready to be served. 0 Komentar Untuk "Recipes How to Make a Delicious Chicken Koloke Practical"